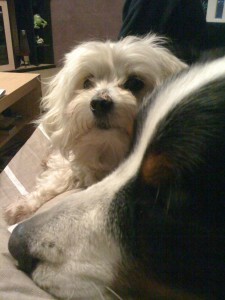 I have two dogs–known respectively as ‘the Big Fella’ and ‘the Little Fella’ for blogging purposes. The Big Fella has his whole life been a bit of a wuss and he’s particularly wussed out by thunder storms. If one hits at night he pushes his way into our bedroom and hauls all 60kgs of himself onto our bed to squish in between us until the storm passes. Or onto the sofa between us if we’re watching TV. If it hits during the day and we’re not home he hunkers down in whatever hole he can dig for himself and salivates horribly with the stress. If it hits when we are home then the only place that makes him truly happy is under my desk. This is clearly not conducive to a good day’s writing for me, so I’ve painstakingly trained him to accept a compromise. When storms hit we go to my smallish study, we turn off the lights and we crank up classical music. I’ve played that for him since he was a pup at times of great relaxation or joy (like car trips, cuddles and leisurely grooming sessions) specifically with the intent that it be like a kryptonite for his anxiety superpower. So… there’s a big storm raging right now. Fellas big and small are locked in the study with me, I’m writing in the dark and Bizet is blaring out of my speakers. And everyone (but me) is fast asleep. Now. It took a while. But…I write barefoot. I sit on a chair which sits on a plastic carpet protector. And I just spun around to go refresh my cup of tea and stepped into an enormous puddle of stress drool. There is nothing–nothing–quite as icky as dog saliva between the toes. But I do feel a certain sense of achievement that I have been able, at all, to get the Big Fella back down the stress Richter scale enough to actually fall asleep (albeit an emotionally exhausted one). Sleep well Big Fella. For as long as you sleep… I write.